Written by Shayla Price on February 1, 2018 . 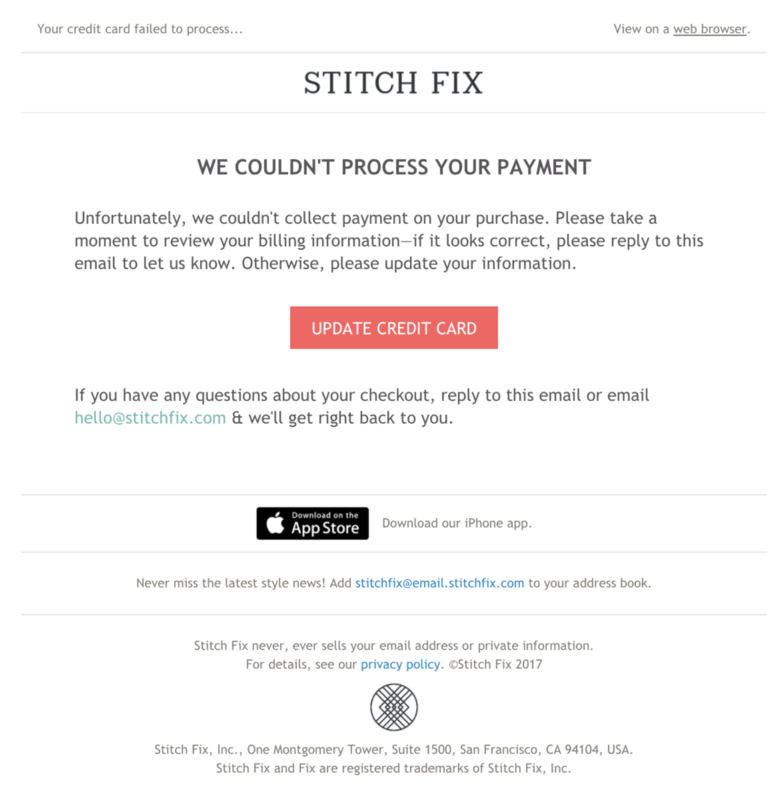 Payment failure contributes to churn. And you don’t want that headache. Dunning emails are an effective way to collect your payment (without nagging). These transactional emails notify users about the status of their accounts and the next steps to continue with your product. From SaaS to subscription companies, one challenge always pops up, conveying the right tone in dunning emails. You want the core message to encourage customers to update their payment information, while reminding customers of the product value. We’ve compiled 9 real-world dunning email examples to show you how companies use these transactional messages to reduce churn and increase retention. We’ll look at what works, and you’ll get ideas on how to improve your own lifecycle delinquency campaign. Let customers know you’re taking action without their intervention. 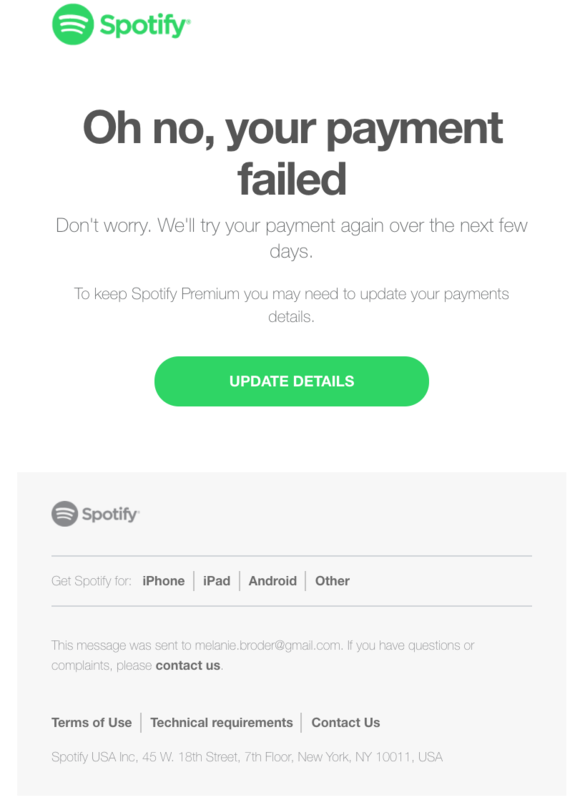 Spotify gives a playful nudge by notifying customers of their attempts to sort out the issue. This “no worries” approach is a helpful message, rather than a scolding. The New York Times rarely buries the lede, and here they put the call to action in the headline. It’s easy to skim with the links and bolded phrases matching the banner color. And while the tone is firm, the company tells customers what they will lose if they don’t take action now. Updating billing information shouldn’t be complicated. 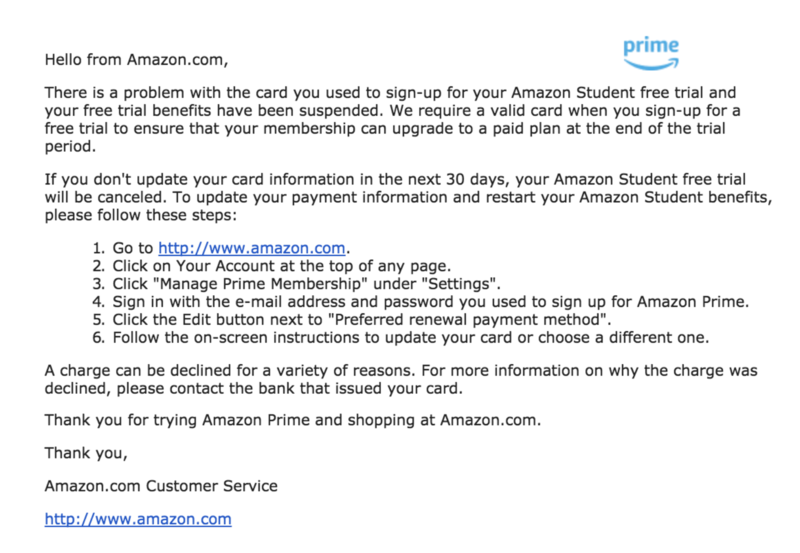 Amazon takes an instructional approach, laying out the payment process step by step. They don’t leave the subscriber to guess what to do next. Plus, outlining the steps helps the customer deduce the length of the process. Customers can decide to do it now or when they have free time. 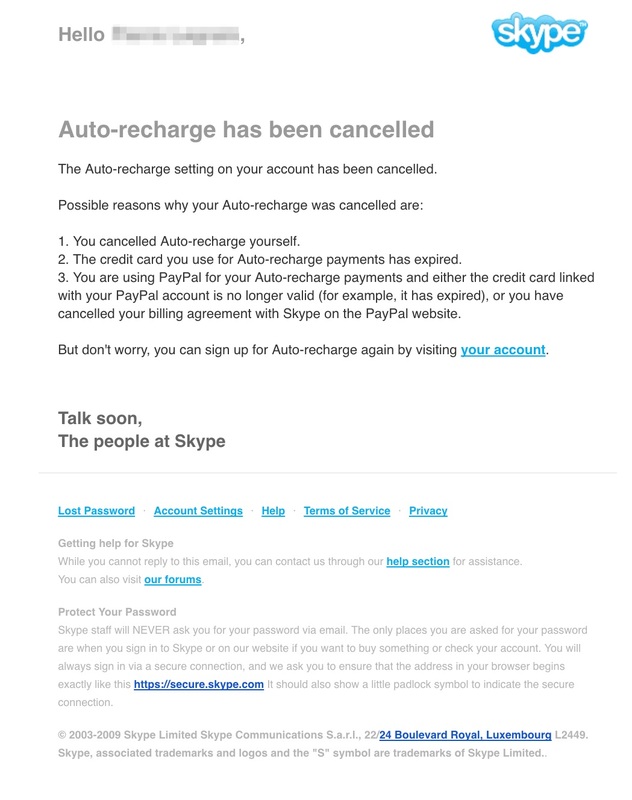 Skype’s post-dunning email makes it simple to understand your account cancellation. If you did intend to cancel your account, this reassurance from Skype is supportive. If you didn’t intend to cancel, this message gives you an opportunity to sign up again. Be willing to give customers a little wiggle room to correct their payment details. 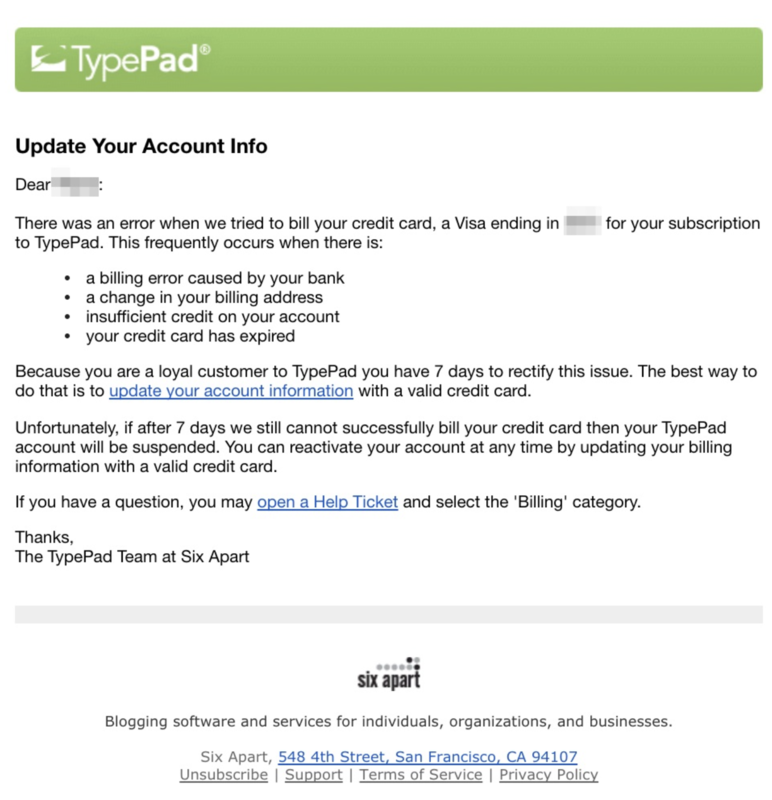 TypePad honors the customer relationship with a grace period after a failed charge. 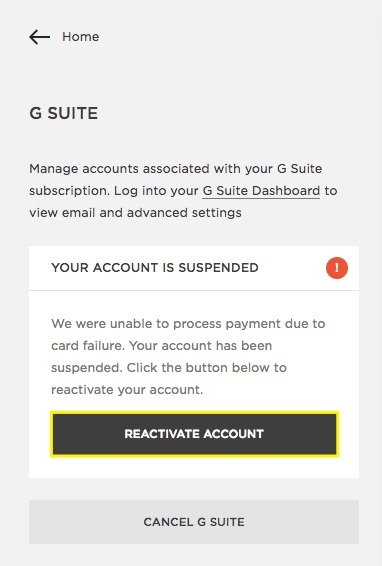 They also make it easy to reactivate an account beyond the 7-day extension. 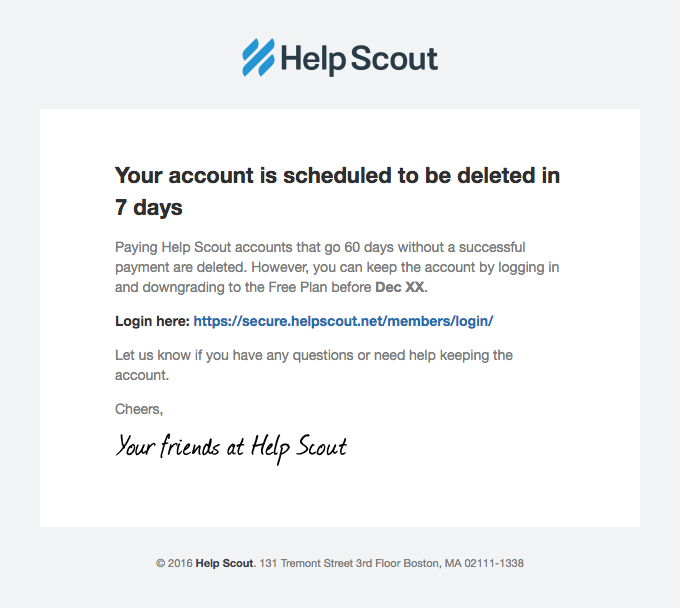 Help Scout offers its customers options. You can either make a payment and continue with your service, or you can downgrade to a free plan with fewer benefits. While account deletion may seem like tough love, it adds urgency to the dunning email. Google knows that specific colors convey certain meanings, so it’s no surprise they used yellow and red in this dunning email. These colors make customers pause and think about what went wrong. And of course, the option to cancel at the bottom is easy to miss (on purpose!). These simple psychological strategies work well. When it comes to urgent notices, you can turn up the pressure without sending customers into a full-fledged panic. 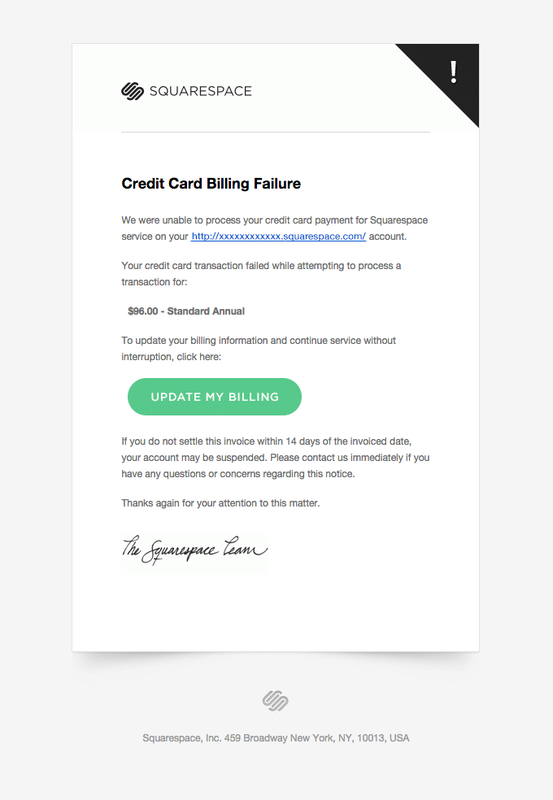 Squarespace has designed their dunning emails with a handy exclamation mark in the top right corner of the email, signaling customers to pay attention to the message. The company mirrors the urgency of the design with their copy. Payment notifications are a standard practice. But there’s always room for improvement. Whether it’s your tone or call to action, experiment with new ways to support your customers. The dunning email is your marketing tool to preventing churn and increasing retention. What makes an effective dunning email? Share your thoughts below!